A projection screen is an installation consisting of a surface and a support structure used for displaying a projected image for the view of an audience. Projection screens may be permanently installed, as in a movie theater; painted on the wall; or portable with tripod or floor rising models. as in a conference room or other non-dedicated viewing space. Another popular type of portable screens are inflatable screens for outdoor movie screening (open air cinema). Uniformly white or grey screens are used almost exclusively as to avoid any discoloration to the image, while the most desired brightness of the screen depends on a number of variables, such as the ambient light level and the luminous power of the image source. Flat or curved screens may be used depending on the optics used to project the image and the desired geometrical accuracy of the image production, flat screens being the more common of the two. Screens can be further designed for front or back projection, the more common being front projection systems, which have the image source situated on the same side of the screen as the audience. Different markets exist for screens targeted for use with digital projectors, movie projectors, overhead projectors and slide projectors, although the basic idea for each of them is very much the same: front projection screens work on diffusely reflecting the light projected on to them, whereas back projection screens work by diffusely transmitting the light through them. In the commercial movie theaters, the screen is a reflective surface that may be either aluminized (for high contrast in moderate ambient light) or a white surface with small glass beads (for high brilliance under dark conditions). The screen also has hundreds of small, evenly spaced holes to allow air to and from the speakers and subwoofer, which often are directly behind it. Rigid wall-mounted screens maintain their geometry perfectly just like the big movie screens, which makes them suitable for applications that demand exact reproduction of image geometry. Such screens are often used in home theaters, along with the pull-down screens. Pull-down screens (also known as manual wall screens) are often used in spaces where a permanently installed screen would require too much space. These commonly use painted fabric that is rolled in the screen case when not used, making them less obtrusive when the screen is not in use. Fixed-frame screens provide the greatest level of uniform tension on the screens surface, resulting in the optimal image quality. They are often used in home theater and professional environments where the screen does not need to be recessed into the case. Electric screens can be wall mounted, ceiling mounted or ceiling recessed. These are often larger screens, though electric screens are available for home theater use as well. Electric screens are similar to pull-down screens, but instead of the screen being pulled down manually, an electric motor raises and lowers the screen. Electric screens are usually raised or lowered using either a remote control or wall-mounted switch, although some projectors are equipped with an interface that connects to the screen and automatically lowers the screen when the projector is switched on and raises it when the projector is switched off. Switchable projection screens can be switched between opaque and clear. In the opaque state, projected image on the screen can be viewed from both sides. It is very good for advertising on store windows. Mobile screens usually use either a pull-down screen on a free stand, or pull up from a weighted base. These can be used when it is impossible or impractical to mount the screen to a wall or a ceiling. Both mobile and permanently installed pull-down screens may be of tensioned or not tensioned variety. Tensioned models attempt to keep the fabric flat and immobile, whereas the not tensioned models have the fabric of the screen hanging freely from their support structures. In the latter screens the fabric can rarely stay immobile if there are currents of air in the room, giving imperfections to the projected image. Specialty screens may not fall into any of these categories. These include non-solid screens, inflatable screens and others. See the respective articles for more information. One of the most often quoted properties in a home theater screen is the gain. This is a measure of reflectivity of light compared to a screen coated with magnesium carbonate, titanium dioxide, or barium sulfate when the measurement is taken for light targeted and reflected perpendicular to the screen. Titanium dioxide is a bright white colour, but greater gains can be accomplished with materials that reflect more of the light parallel to projection axis and less off-axis. Frequently quoted gain levels of various materials range from 0.8 of light grey matte screens to 2.5 of the more highly reflective glass bead screens, some manufacturers claiming even higher numbers for their products. Very high gain levels could be attained simply by using a mirror surface, although the audience would then just see a reflection of the projector, defeating the purpose of using a screen. Many screens with higher gain are simply semi-glossy, and so exhibit more mirror-like properties, namely a bright "hot spot" in the screen—an enlarged (and greatly blurred) reflection of the projector’s lens. Opinions differ as to when this "hot spotting" begins to be distracting, but most viewers do not notice differences as large as 30% in the image luminosity, unless presented with a test image and asked to look for variations in brightness. This is possible because humans have greater sensitivity to contrast in smaller details, but less so in luminosity variations as great as half of the screen. Other screens with higher gain are semi-retroreflective. Unlike mirrors, retroreflective surfaces reflect light back toward the source. Hot spotting is less of a problem with retroreflective high gain screens. Unfortunately, at the perpendicular direction used for gain measurement, mirror reflection and retroreflection are indistinguishable, and this has sown confusion about the behavior of high gain screens. A second common confusion about screen gain arises for grey colored screens. If a screen material looks grey on casual examination then its total reflectance is much less than 1. However, the grey screen can have measured gain of 1 or even much greater than 1. The geometric behavior of a grey screen is different from that of a white screen of identical gain. Therefore, since geometry is important in screen applications, screen materials should be at least specified by their gain and their total reflectance. Instead of total reflectance, "geometric gain" (equal to the gain divided by the total reflectance) can be the second specification. Curved screens can be made highly reflective without introducing any visible hot spots, if the curvature of the screen, placement of the projector and the seating arrangement are designed correctly. The object of this design is to have the screen reflect the projected light back to the audience, effectively making the entire screen a giant "hot spot". If the angle of reflection is about the same across the screen, no distracting artifacts will be formed. Semi-specular high gain screen materials are suited to ceiling-mounted projector setups since the greatest intensity of light will be reflected downward toward the audience at an angle equal and opposite to the angle of incidence. However, for a viewer seated to one side of the audience the opposite side of the screen is much darkened for the same reason. Some structured screen materials are semi-specularly reflective in the vertical plane while more perfectly diffusely reflective in the horizontal plane to avoid this. Glass-bead screens exhibit a phenomenon of retroreflection; the light is reflected more intensely back to its source than in any other direction. They work best for setups where the image source is placed in the same direction from the screen as the audience. With retroreflective screens, the screen center might be brighter than the screen periphery, a kind of hot spotting. This differs from semi-specular screens where the hot spot's location varies depending on the viewer's position in the audience. Retroreflective screens are seen as desirable due to the high image intensity they can produce with a given luminous flux from a projector. Square-shaped screens used for overhead projectors sometimes double as projection screens for digital projectors in meeting rooms, where space is scarce and multiple screens can seem redundant. These screens have an aspect ratio of 1:1 by definition. Most image sources are designed to project a perfectly rectangular image on a flat screen. If the audience stays relatively close to the projector, a curved screen may be used instead without visible distortion in the image geometry. Viewers closer or farther away will see a pincushion or barrel distortion, and the curved nature of the screen will become apparent when viewed off-axis. Apparent contrast in a projected image — the range of brightness — is dependent on the ambient light conditions, luminous power of the projector and the size of the image being projected. A larger screen size means less luminous (luminous power per unit solid angle per unit area) and thus less contrast in the presence of ambient light. Some light will always be created in the room when an image is projected, increasing the ambient light level and thus contributing to the degradation of picture quality. This effect can be lessened by decorating the room with dark colours. The real-room situation is different from the contrast ratios advertised by projector manufacturers, who record the light levels with projector on full black / full white, giving as high contrast ratios as possible. Manufacturers of home theater screens have attempted to resolve the issue of ambient light by introducing screen surfaces that direct more of the light back to the light source. The rationale behind this approach relies on having the image source placed near the audience, so that the audience will actually see the increased reflected light level on the screen. Highly reflective flat screens tend to suffer from hot spots, when part of the screen seems much more bright than the rest. This is a result of the high directionality (mirror-likeness) of such screens. Screens with high gain also have a narrower usable viewing angle, as the amount of reflected light rapidly decreases as the viewer moves away from front of such screen. Because of the said effect, these screens are also less vulnerable to ambient light coming from the sides of the screen, as well. A relatively recent attempt in improving the perceived image quality is the introduction of grey screens, which are more capable of darker tones than their white counterparts. A matte grey screen would have no advantage over a matte white screen in terms of contrast; contemporary grey screens are rather designed to have a gain factor similar to those of matte white screens, but a darker appearance. A darker (grey) screen reflects less light, of course—both light from the projector and ambient light. This decreases the luminance (brightness) of both the projected image and ambient light, so while the light areas of the projected image are dimmer, the dark areas are darker; white is less bright, but intended black is closer to actual black. Many screen manufacturers thus appropriately call their grey screens "high-contrast" models. Although a projection screen cannot improve a projector's contrast level, the perceived contrast can be boosted. In an optimal viewing room, the projection screen is reflective, whereas the surroundings are not. The ambient light level is related to the overall reflectivity of the screen, as well as that of the surroundings. In cases where the area of the screen is large compared to that of the surroundings, the screen’s contribution to the ambient light may dominate and the effect of the non-screen surfaces of the room may even be negligible. Some examples of this are planetariums and virtual-reality cubes featuring front-projection technology. Some planetariums with dome-shaped projection screens have thus opted to paint the dome interior in gray, in order to reduce the degrading effect of inter-reflections when images of the sun are displayed simultaneously with images of dimmer objects. Grey screens are designed to rely on powerful image sources that are able to produce adequate levels of luminosity so that the white areas of the image still appear as white, taking advantage of the non-linear perception of brightness in the human eye. People may perceive a wide range of luminosities as "white", as long as the visual clues present in the environment suggest such an interpretation. A grey screen may thus succeed almost as well in delivering a bright-looking image, or fail to do so in other circumstances. Compared to a white screen, a grey screen reflects less light to the room and less light from the room, making it increasingly effective in dealing with the light originating from the projector. Ambient light originating from other sources may reach the eye immediately after having reflected from the screen surface, giving no advantage over a white high-gain screen in terms of contrast ratio. The potential improvement from a grey screen may thus be best realized in a darkened room, where the only light is that of the projector. Partly fueled by popularity, grey screen technology has improved greatly in recent years. Grey screens are now available in various gain and grey-scale levels. Certain screens are claimed to selectively reflect the narrow wavelengths of projector light while absorbing other wavelengths in the optical spectrum. 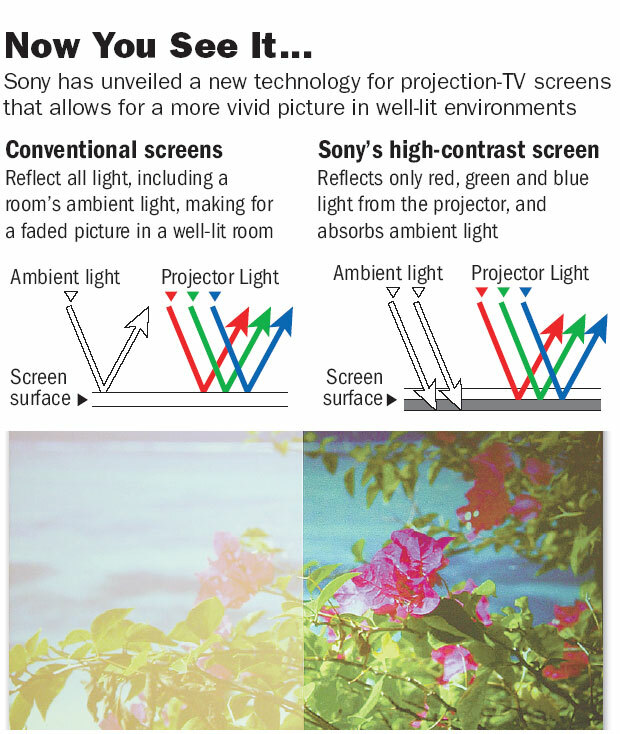 Sony makes a screen  that appears grey in normal room light, and is intended to reduce the effect of ambient light. This is purported to work by preferentially absorbing ambient light of colors not used by the projector, while preferentially reflecting the colors of red, green and blue light the projector uses. A true color-selective screen has not been substantiated. A contrast-enhancing screen has been introduced by Dai Nippon Printing (DNP) and Screen Innovations that is based on thin layers of black louvers rather than wavelength-selective reflection properties. In an optimally configured system, projection screen surface and the real image plane are made to coincide. From an optical point of view, a screen is not needed for the image to form; screens are rather used to make an image visible. ^ Kylie, Sarah. "Projector Labs". ^ Seán Byrne. Sony introduces black projector screen for well-lit up areas. June 24, 2004. ^ Gizmodo. Picture of Sony's Black Backed Projection Screen Archived 2006-05-23 at the Wayback Machine. June 29, 2004. Black Widow (paint mix) (also known as a Black Widow Ultra (EU) or (Black Widow US) is a non-commercial open source project to design a paint mix to be used as the base DIY (do it yourself) projection screen. Led by Mechman Alternators (US), Wbassett (US) and Custard10 (EU), the paint mix is made from easily accessible materials from the United States and the European Union, and could outperform commercial projection screens. Black Widow Paint is a paint with four special slick agents that seek to be competitive with other projection screen manufactures. "Burn" is a song recorded by American industrial rock band Nine Inch Nails for the soundtrack to the 1994 film Natural Born Killers. It was released as a promotional single from the soundtrack. The song was included as a bonus track on the 10th anniversary deluxe edition of The Downward Spiral in 2004. Live performances of the song are featured on KROQ Christmas 2005 and the concert film Beside You in Time. The Coca-Cola Headquarters is a campus in Atlanta, Georgia that is home to The Coca-Cola Company in the city's midtown. The most visible building on the site is a 29-storey, 403 foot (122.8 m) high structure called One Coca-Cola Plaza. Located on the corner of North Avenue and Luckie Street, the International Style building was completed in 1979. The architect was FABRAP and the designer Bob Foker. The building and complex is located across the street from Georgia Institute of Technology and Midtown Atlanta. In May 2011, to celebrate the 125th anniversary of Coca-Cola, a projection screen was made for the building that would display various Coke ads through the years and also transformed the building into a huge cup of ice which then was "filled" with Coke. Gain is a property of a projection screen, and is one of the specifications quoted by projection screen manufacturers. Heritage High School is a high school in Brentwood, California, United States. It opened on August 1, 2005, with a freshman and sophomore class. The school grew every year until it reached the capacity of all four classes (freshman, sophomore, junior, and senior) in 2008. The Heritage High School class of 2008 was the highest grade each year it was at Heritage, and was its first graduating class. The school features include a state-of-the-art theatre, recording studio, broadcast studio (with green screen), and large rear projection screen TVs in every classroom. Its colors are gold, Columbia blue, and white, and its mascot is the Patriot. It was recently credited with the six-year status highest API score in the district. An inflatable movie screen is an inflatable framework with an attached projection screen. Inflatable screens are used for outdoor movies, film festivals, drive-in theaters, sports, social, fundraising and other events requiring outdoor projection. Keypad Polling is a wireless polling technology. It can be used to enable community participation in events and to bring a focus to discussion and decision making.One example of this technology comprises a number of hand held keypads (similar to TV remote controls) which communicate using radio frequencies with a base station. This base station is connected to a laptop computer which in turn is linked to a VGA projector that displays onto a projection screen. Participants vote anonymously by selecting the number on their keypad that best represents their preference. The result of the group vote is displayed on the projection screen within seconds. The project team also works with clients to prepare suitable questionnaires and produce report documents that analyse voting results. Kodascope is a name created by Eastman Kodak Company for the projector it placed on the market in 1923 as part of the first 16mm motion picture equipment. The original Kodascope was part of an outfit that included the Cine-Kodak camera, tripod, Kodascope projector, projection screen, and film splicer, all of which sold together for $335. By 1924, Victor Animatograph Corporation and Bell and Howell had placed 16mm projectors on the market, so Kodak eliminated the requirement to purchase the equipment as a complete outfit and sold the projector separately. Kodascope was retained as the primary marketing name for 16mm projectors throughout their production life at Kodak. One specific Kodascope was the 'Bedaux Measurement Cine-Kodak' which was produced for use in conjunction with the Bedaux System.It was also used to name Kodak's film rental library system. Kodascope Library, which operated from 1924 to 1939, and offered both educational and commercially released films on 16mm film and, from 1932, on 8mm film. The Phoenix Concert Theatre is a nightclub and concert venue located at 410 Sherbourne Street in Toronto, Ontario, Canada. It is 18,000 sq ft (1,700 m2) large and encompasses three distinct environments. The "Main Room" features one of the city's largest dance floors, leading edge sound and light, five bars (including a 50-foot (15 m) marble bar), 20x30 foot stage, a giant projection screen and one of the largest mirror balls in Canada. "Le Loft" overlooks the main room, features an overhanging balcony which stretches the entire width of the club, lounge seating for over 100, and its own separate bar, custom artwork, and two television screens. The "Parlour" is reachable from the main room and the front entrance, features a separate sound system, a separate dancefloor and lighting system, a decorative bar, lounge seating and four pool tables. A slide is a single page of a presentation. Collectively, a group of slides may be known as a slide deck. A slide show is an exposition of a series of slides or images in an electronic device or in a projection screen. Before the advent of the personal computer, a presentation slide could be a 35 mm slide viewed with a slide projector or a transparency viewed with an overhead projector. In the digital age, a slide most commonly refers to a single page developed using a presentation program such as Microsoft PowerPoint, Apple Keynote, Apache OpenOffice or LibreOffice. It is also possible to create them with a document markup language, for instance with the LaTeX class Beamer. Lecture notes in slide format are referred to as lecture slides, frequently downloadable by students in .ppt or .pdf format. A projector or image projector is an optical device that projects an image (or moving images) onto a surface, commonly a projection screen. Most projectors create an image by shining a light through a small transparent lens, but some newer types of projectors can project the image directly, by using lasers. A virtual retinal display, or retinal projector, is a projector that projects an image directly on the retina instead of using an external projection screen. The Rebels and Bandoleros Tour was a worldwide concert tour by American rock band ZZ Top. First joining forces in 1974, Lynyrd Skynyrd toured with the group for two-and-a-half weeks during its initial leg, and for the latter part of the second leg in the United States. In contrast to ZZ Top's elaborately staged events from previous tours, the Rebels and Bandoleros Tour stage design was simple, yet embellishing. The stage featured dozens of lights and a large projection screen displayed behind the stage, which showed visual effects, video clips, and text phrases. Whereas ZZ Top was known for their enthusiastic live show in the 1970s, the group's Rebels and Bandoleros performances were intentionally ironic and self-reflective. Like other ZZ Top tours, each of the Rebels and Bandoleros shows opened with the same three songs before other material was played. With three legs and 79 shows, the tour began in Wichita, Kansas on May 12, 2011 and ended in Charleston, West Virginia on October 30, 2011. Its initial two legs visited the US and Europe before returning for a final leg in North America. After its conclusion, three shows were booked for the Rock Legends Cruise in Fort Lauderdale, Florida, which featured acts such as George Thorogood and Steppenwolf. The tour was generally well received and gained positive reactions from music critics. Although it wasn't one of the highest-grossing tours of 2011, a concert in Orange Beach, Alabama with Lynyrd Skynyrd was the highest-grossing show of the Rebels and Bandoleros tour. A silver screen, also known as a silver lenticular screen, is a type of projection screen that was popular in the early years of the motion picture industry and passed into popular usage as a metonym for the cinema industry. The term silver screen comes from the actual silver (or similarly reflective aluminium) content embedded in the material that made up the screen's highly reflective surface. Actual metallic screens are coming back into use in projecting 3-D films. 35 mm slide projectors, direct descendants of the larger-format magic lantern, first came into widespread use during the 1950s as a form of occasional home entertainment; family members and friends would gather to view slide shows. Reversal film was much in use, and supplied slides snapped during vacations and at family events. Slide projectors were also widely used in educational and other institutional settings. A slide show is a presentation of a series of still images on a projection screen or electronic display device, typically in a prearranged sequence. The changes may be automatic and at regular intervals or they may be manually controlled by a presenter or the viewer. Slide shows originally consisted of a series of individual photographic slides projected onto a screen with a slide projector. When referring to the video or computer-based visual equivalent, in which the slides are not individual physical objects, the term is often written as one word, slideshow.A slide show may be a presentation of images purely for their own visual interest or artistic value, sometimes unaccompanied by description or text, or it may be used to clarify or reinforce information, ideas, comments, solutions or suggestions which are presented verbally. Slide shows are sometimes still conducted by a presenter using an apparatus such as a carousel slide projector or an overhead projector, but now the use of an electronic video display device and a computer running presentation software is typical. Smart film, also called Switchable film, is a product that is capable of adjusting light transmission between transparent and opaque using AC power. Due to moisture sensitivity, earlier versions of the film were used only to make smart glass by lamination on glass. With continual improvement in moisture resistance, the new (3rd) generation of the film can be directly installed on existing windows with special glue or self-adhesive. It combines many functions, such as light adjustment, UV and infrared blocking, advertising and security. Most of the film applications are via glass, acrylic or polycarbonate laminates, mainly having to do with the voltage (110VAC) required to operate the film. Companies continue to attempt various installation methods in order to use the film by itself without having to add the lamination cost. One of the advantages of smart film is that it eliminates the need for blinds, shades or window treatments. A video projector is an image projector that receives a video signal and projects the corresponding image on a projection screen using a lens system. All video projectors use a very bright light or laser to project the image, and most modern ones can correct any curves, blurriness, and other inconsistencies through manual settings. Video projectors are used for many applications such as conference room presentations, classroom training, home cinema and concerts. In schools and other educational settings, they are sometimes connected to an interactive whiteboard. In the late 20th century they became commonplace in home cinema. Although large LCD television screens became quite popular, video projectors are still common among many home theater enthusiasts. In photography and optics, vignetting (, UK also ; French: vignette) is a reduction of an image's brightness or saturation toward the periphery compared to the image center. The word vignette, from the same root as vine, originally referred to a decorative border in a book. Later, the word came to be used for a photographic portrait that is clear at the center and fades off toward the edges. A similar effect is visible in photographs of projected images or videos off a projection screen, resulting in a so-called "hotspot" effect. Vignetting is often an unintended and undesired effect caused by camera settings or lens limitations. However, it is sometimes deliberately introduced for creative effect, such as to draw attention to the center of the frame. A photographer may deliberately choose a lens that is known to produce vignetting to obtain the effect, or it may be introduced with the use of special filters or post-processing procedures. When using superzoom lenses, vignetting may occur all along the zoom range, depending on the aperture and the focal length. However, it may not always be visible, except at the widest end (the shortest focal length). In these cases, vignetting may cause an exposure value (EV) difference of up to 0.75EV. Westfield Riccarton, (also known by its former name Riccarton Mall), is a large retail complex located in the Christchurch, New Zealand suburb of Riccarton. First opened in 1965, it is Christchurch's oldest shopping mall.Riccarton Mall was extensively remodeled around 1994–1995 with most stores relocating to new premises within the mall; Farmers is one of the few stores to remain in its original location. The remodel introduced a food court into the mall and a new rooftop car park. In 2003 Westfield began a NZD$90 million redevelopment of the shopping centre which was completed in 2005. A strong focus of the redevelopment was a leisure component, with the introduction of the six-screen Hoyts Cinema multiplex, which features the second-largest projection screen in New Zealand. In addition to the cinema, a restaurant and café area was constructed at the Rotherham Street end of the mall. On 28 May 2009, the mall opened phase one of a new $75m expansion. The latest redevelopment included 40 new retailers and a new café court. An additional cinema screen was added to the existing Hoyts Multiplex. The first stage of development, a new four-level car park building with space for 400 cars, was completed in January 2009. The expansion increased the size of the mall to approximately 54,000 square metres. Annual sales for the full year 2018 were $535.6 million.